I’m a fruit binger. When summer hits, I pack the fridge with cherries, peaches, plums, and berries. This time of year, each is at the peak of its flavor, and I can usually find an assortment on sale. When cherries dropped below $2 a pound, I went nuts and wound up buying a cherry pitter to keep up with my mass consumption. Nothing will slow this summer-fruit fanatic. In summer, I fit fresh fruit into every meal possible, topping breakfast cereals, lunch salads, and dinner dishes, plus some mandatory direct-from-fridge consumption. The sweetest bite of them all…DESSERT! From the recipe box of my Grammy, I proudly present PRIZE PEACH COBBLER, a blue-ribbon worthy finish to any meal. Peaches are delectable. 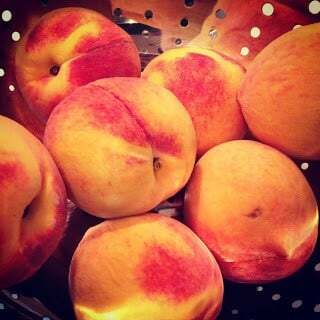 Plump and fragrant, they are the fruit of choice for a lovely compliment (“You’re a peach!”), a positive state of being (“Peachy keen”) and the subject of a classic ‘90s hit (“Peaches” by The Presidents of the United States of America). Peaches literally rock. In my family, Prize Peach Cobbler is a sacred summer tradition. My sister loves it so much that at the age of seven, she started to ask for peach cobbler instead of birthday cake. Smart girl. A few weeks ago, Ben and I’s friend Matt came to visit, and I made peach cobbler for the occasion. His words two bites in: “I never want it to end.” Neither will you. 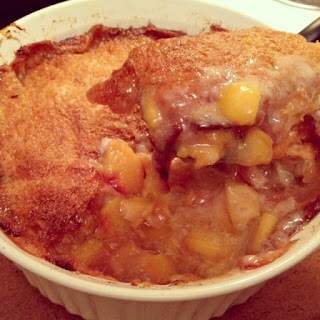 As if its ooey-gooey nectar goodness isn’t enough, Prize Peach Cobbler is truly easy. Seriously. Amateur bakers, you can do this. The toughest part is peeling the peaches, and I’ve included a short cut for that too. From my family to yours, a must eat for summer. May it never end! Juicy, messy, golden bliss. Everything a peach should be! Peach Cobbler recipe that is a blue-ribbon winner. Traditional recipe from the author's grandma that is easy to prepare and tastes fresh and magnificent. Preheat oven to 350°F. Sift together flour, salt, and baking powder. Mix in 1 cup sugar. Slowly stir in milk to make batter. Melt butter in deep casserole dish (about 3 quarts). Pour batter over melted butter. Do not stir. Bring a large pot of water to a boil. Carefully add peaches (I use tongs) and boil for about 1 minute. Remove peaches from pot and plunge into a bowl of cold water to stop cooking. Skins can now be easily removed with fingers. Slice peaches into bite-sized pieces. In a clean bowl, Mix the peeled, sliced peaches and 3/4 cup sugar thoroughly and carefully spoon them over the batter..
Bake 1 hour. Batter should be nicely browned on top before removing from oven. Top with heavy cream or vanilla ice cream. *Ingredient tip: Be sure peaches are ripe and slightly soft—place in brown paper bag on counter-top for a few days to ripen if necessary. Ripe and ready for the oven. Batter and peaches do a little switcheroo in the oven. It works like science, but tastes like magic! Hello! Came across your peach cobbler recipe on pinterest and decided to give it a try. My father in law handed me a bag of peaches from his peach tree. I am baking it right now with 20 minutes to go! I only tweaked it a little adding cinnamon and a touch of vanilla extract, Thanks for sharing this recipe! Oh I hope you guys loved it! It’s so simple, but I feel like it is total magic when it comes out of the oven. Thanks for giving it a try! I made this in the spring when peaches were available here in California, so amazing! I loved the switcheroo part because it really infused the flavors of peaches into the “cake” part. I’m thinking of trying it with apples just to see if it has the same magic. Kelly, this is one of my all-time favorite recipes! I’ve never tried it with apple, but I imagine it would be delicious. My only suggestion would be to sauté apples a little bit first with butter and cinnamon, so that they go into the oven a little soft, just like a ripe peach. Thanks so much, and if you try it I would love to hear how it turns out! This is the best peach cobbler EVER! So easy to make.. I have made 6 already. The man that gave me amazing peaches..,I made this cobbler for him as a thank you…he loved it, and brought me more peaches! So I found out another neighbor was in the hospital, the day she came home, I dropped off a cobbler for her. Then my closet neighbors that watch our house when we on vaca…made 3 more for them, and of course, I made one for myself! It is so delicious, especially served warm with vanilla bean ice cream on top! The only thing different I did was add 1/4 cup of dry tapioca to the peaches, before pouring them into the crust, .it made the juice a little thicker, not that it needed that, we just like tapioca. Thank you for sharing this wonderful recipe…It is a KEEPER!! Mary, I’m so happy to hear you love this cobbler and how you’ve been making it for so many people! Thank you so much for taking the time to leave this awesome review. I’ve looked for a new peach cobbler recipe forever it seems. I don’t care for dump cake mix things and wouldn’t even try it. Tracey, I hope you enjoy it!